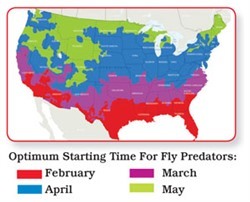 One secret to a fly free summer is to start Fly Predators before you have lots of flies. The optimum month to start is shown in this chart. This is when the daytime highs get into the 60 ’s and your likely chance of a hard frost is over. To get an exact recommend starting date that is based on 39 years of weather history for your zip code click here. This is always before the flies are a problem. By starting prior to the first fly hatch there will be relatively few viable fly pupae that survived the winter so the ratio of Fly Predators to fly pupae is high. This allows the Fly Predators to reduce the initial fly breeding population to a very low level which can mean fewer flies all summer. It’s the same as pulling up the first dandelions you see in your lawn. Get them quick before the go to seed and you won’t have many the rest of the summer. Wait until July, forget it, there will just be too many. With flies it’s not as hopeless if you start late. If they have built up to high levels, an initial shipment of two to three times the normal Fly Predator quantity will be needed plus use the correct traps and or baits to get control of the adult fly population as quickly as possible. This is really useful - Thanks Tom! This is so incredibly useful, I've DEFINITELY noticed a build up and almost 'swarm' of these flies coming around, its terrible! Good to know, I'm going to have to stock up and spread the word! Just ordered my fly predators, very excited to see results this summer. Pesty Flies bothered my horses last summer! !